In a way it is, but what's needed to make an infinitey ingot doesn't even compare to mining ore, etc. But to make it you also have to mine a lot of ores. Can you please consider to add support for Integrated Dynamics? A chicken for Crystalized Menril chunk. Can i add in the json file my own chicken??? I take a look and seems to be "easy"... but i can't understand which color the chicken appears. Will you add the Applied Energetics Certus Quartz and or Flux crystal? Should you do Quark Chickens? 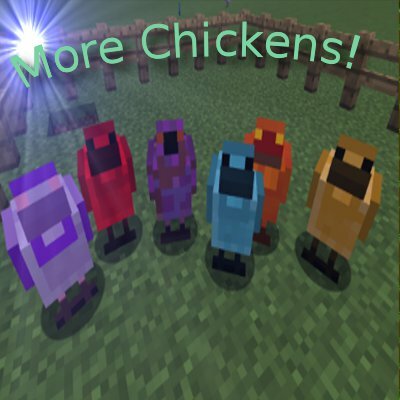 The latest version, More Chickens v3.0.0 (1.12.2), is incompatible with 1.12 despite being listed as 1.12 friendly. incompatible how? I'm able to load up in 1.12.2 and load a save game but we are having trouble with other players joining on LAN. Used to work and I'm wondering if this might be part of the issue. I'm running 1.12 & get the splash screen saying it's incompatible, so it's fairly conclusive. the base mod required for this mod just updated to 1.12.2 good job Gen. They will be coming.. I'm fixing issues in the base mod currently. Could you add on chickens for advent of ascension? This would be OP, but, this mod itself is OP so, yeah. can i add it on a modpack ?